CMS offers comprehensive software and technology solutions for the commercial contruction industry. Our industry experience and knowledge gives us the advantage over other services to provide construction companies with the tools and services required for a successful technology infrastructure. Our solutions and expertise provide unparalleled benefits for construction companies searching for technologies that fit their business. From out of the box applications to customized solutions, CMS will become a valued partner for your business. Contact us for a free, personalized consultation and see how your business can thrive with CMS solutions and services. CMS provides software solutions, custom apps and cloud services that allow our company to operate efficiently and securely. Their reliability, depth of knowledge and client service is outstanding! CMS has given us the solutions that fit our business logic and needs. Their services, skills, knowledge and technologies simply make our company better. The technologies CMS provides VCC allows us to easily customize and quickly accommodate to the demands and needs of our industry. As a national general contractor, these technologies help our company stay closely connected at all times ensuring the consistency of our workflows, brand and philosophies. CMS made it easy for us to understand the value they could provide our business. Their knowledge and expertise has proven to be an asset to our company by helping us increase our efficiencies and achieve our business objectives. 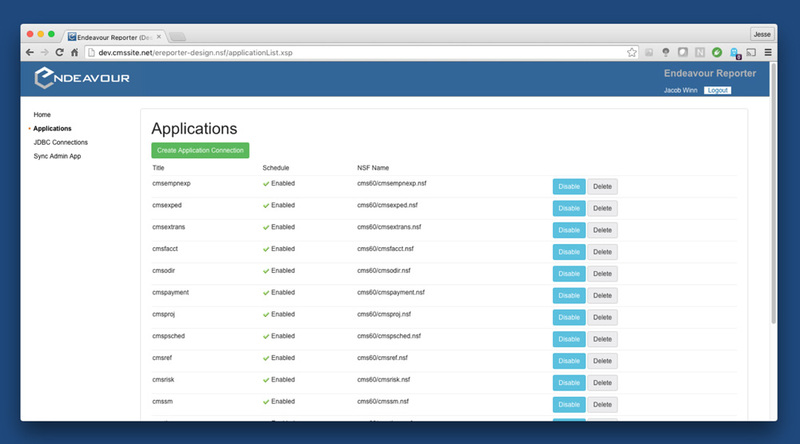 In addition, CMS's cloud solutions helped us become entirely mobile on all devices. Endeavour Construction Management Suite is a construction management system that handles everything a construction company needs, from managing contracts and scheduling to tracking submittals and recording daily diaries. Owners, Contractors, Subcontractors and Architects can organize their tasks, manage their projects and collaborate through Endeavour’s web portal. 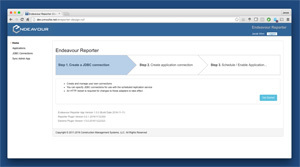 Endeavour Reporter is a live reporting tool developed for domino databases that is built to address the very common need of Domino shops to do SQL-style reporting with standardized tools. Reporter is extremely efficient in streamlining the process of creating tables in a SQL server and replicating over the data. It also includes the capability to replicate with other arbitrary systems and has a two-way replicator for Domino. 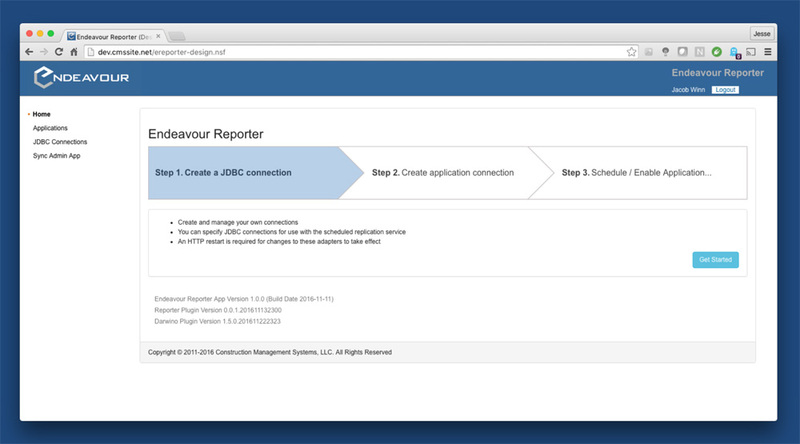 This replicator allows the creation of "replicas" of existing Domino databases with no Domino code changes. Endeavour Pay allows General Contractor's to become more efficient with lien waivers, applications for payment, subcontracts and change orders by enabling the exchange of electronic documents and payments with their subcontractors and vendors. Our alliances with almost all telecom carries enables us to help design the right network for our customers, both hardwired and mobile. Most importantly, we manage all setup of equipment and monitoring of services. For mobility, CMS's "Connection in a Box" solution is imperative for any mobile workforce, especially mobile construction sites. Our expertise is understanding our customer's needs and delivering the right solutions to stay connected. Most companys have different needs and processes. CMS can create custom apps that fit your business rules and needs promoting efficiency, integration and mobility. Our developers and application architects are experts integrating with many different platforms and products, and our web designers can bring new life to your web presence. Most would agree if your not already in the cloud, you should be! No one wants to deal with servers and hardware anymore. CMS provides cloud infrastructure and management enabling you to focus on the important challenges of your business. Your company apps become accessible from anywhere on any device, and our cloud engineers become part of your team to ensure that busniess operations are running 24/7/365. Most construction companies need a CIO (Chief Information Officer) but cannot justify the cost of having one full-time. Our CIO service provides effective business technology leadership, advice, direction and only when you need it. With our service you can have CIO expertise on tap, on demand and on your side without the price tag of a full-time CIO. We will be in contact with you very soon, thank you! Copyright © 2019 CMS, LLC. All Rights Reserved.